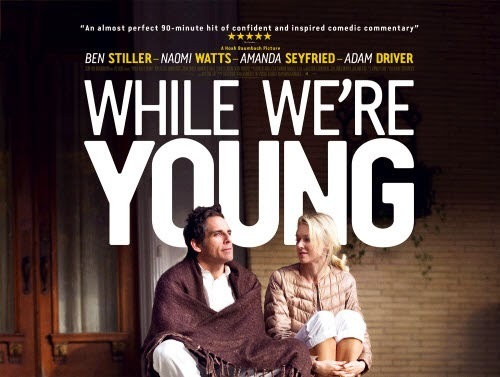 WHILE WE’RE YOUNG is an openly funny cross-generational comedy of manners about aging, ambition, and success, as well as a moving portrait of a marriage tested by the invading forces of youth. Stiller and Watts are Josh and Cornelia Srebnick, happily married middle-aged members of New York’s creative class. Josh labours over the umpteenth edit of his cerebral new film, it’s clear that he has hit a dry patch and that something is still missing. Enter Jamie and Darby (Driver and Seyfried) a free-spirited young cou­ple, who are spontaneous and untethered, ready to drop everything in pursuit of their next passion. For Josh, it’s as if a door has opened back to his youth—or a youth he wishes he once had. It’s not long before the restless forty-somethings, Josh and Cornelia, throw aside friends their own age to trail after these young hipsters who seem so plugged in, so uninhibited, so Brooklyn cool.